In my last post I summarized some alarming trends and statistics reflecting our country’s epidemic of opioid addiction. I also pointed out that while research supports the effectiveness of prescribing opioids for the treatment of acute trauma, before and after surgery, cancer pain and pain associated with end of life illness, “the evidence is limited for the use of chronic opioid therapy for chronic pain.” In fact, last year the Centers for Disease Control advised doctors to exercise extreme caution before prescribing opioids for chronic pain. Fortunately, there is a growing body of research affirming the efficacy of a range of safer nondrug, noninvasive treatments for relieving many chronic pain problems like: back pain, fibromyalgia, severe headache, arthritis and neck pain. Recently, the National Institutes for Health (NIH) made drug-free pain management a top priority. A comprehensive summary of the effectiveness of non-drug treatments for common pain problems was published in 2016 by the Mayo Clinic. Based on well-designed clinical trials they reported that the following approaches “may help some patients manage their painful health conditions”: acupuncture and yoga for back pain; acupuncture and tai chi for osteoarthritis of the knee; massage therapy for neck pain and relaxation techniques for severe headaches and migraine. New research coming out of Boston Medical Center finds that a yoga protocol developed specifically for back pain can be as safe and effective as physical therapy in easing chronic (lower) back pain. This protocol was designed with input from yoga teachers, doctors and physical therapists and a guidebook that details the poses taught during the class is freely available. At the beginning of this study, 70% of the patients were taking pain medication. At the end of three months the percentage of yoga participants still taking pain medication had dropped to 50%. A 2016 study published in the Journal of the AMA found that 43.6 % of participants in mindfulness training (which included both meditation and yoga instruction) reported a significant reduction in pain after 26 weeks. The same 2016 AMA study also reported that 44.9% of the group who received cognitive behavioral therapy experienced significant improvements as well. Cognitive behavioral therapy is a form of counseling that helps people think and respond differently to their experiences (like pain) and is now considered an evidence-based treatment for chronic pain. It’s remarkable that we are now seeing the most prestigious medical journals and leading public health research organizations like NIH and CDC endorsing alternative treatments including yoga and meditation and cognitive behavioral therapy for pain. It’s not so long ago that these holistic treatments operated at the fringes of traditional medicine. Given these developments in the domain of pain management why would anyone want to chance all the risks associated with highly addictive narcotics when there are safe and effective alternatives? According to Dan Cherkin, a senior researcher on back pain, the answer in part is that there is no medical “cure” for chronic back pain. As a result people are often afraid and distressed and feel that “their pain is not being validated” by their doctors. The pressure to do something, in the absence of a cure has helped drive the astounding increase of opioids being prescribed for chronic pain. In addition, a lot of the effective alternative treatments like mindfulness training, yoga and cognitive behavioral therapy may not be covered by insurance while some of the least effective, expensive (and sometimes addictive) treatments are readily available and paid for by insurance. 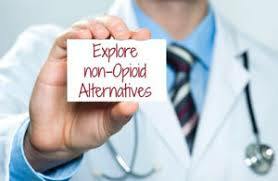 The bottom line is if you suffer with pain- not associated with acute trauma, surgery, cancer or end of life issues- make sure you have a thorough discussion with your doctor about the well-documented risks of opioids, and the availability of safe and effective alternatives to drug-based treatments for pain.